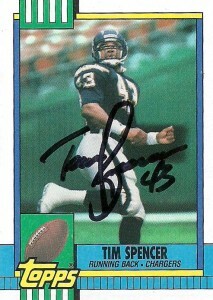 Tim Spencer was another one of these unheralded runningbacks from the mid-80s. He had his shining moment as one of the players in the rival United States Football League, then popped up again briefly as a fullback and change of pace back for Marion Butts, Gary Anderson, Lionel James or whomever else was in the lineup. After finishing second in Ohio State rushing history behind Archie Griffin, Spencer was drafted by the Chicago Blitz of the USFL where he quietly racked up 300 carries for 1,157 yards and 6TDs in 1983. In his second year with the league, he had a career best 17 TDs rushing and 1,212 yards with the Arizona Wranglers. As the league imploded, Spencer continued to run hard, this time for the Memphis Showboats. He’d contribute another 789 yards and 3 TDs. 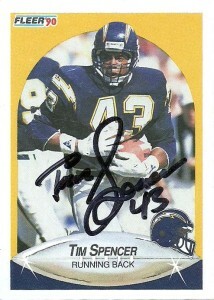 The Chargers wisely invested an 11th round choice in Spencer in 83. This paid dividends immediately following the disolution of the USFL in 1985. He’d hop in as a short yardage blocking back rushing for 478 yards and an NFL career high 10 TDs. 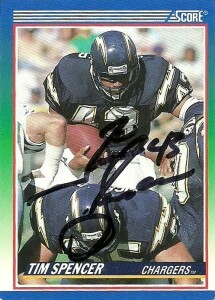 Tim played for the Chargers through the 1990 season with his best yards from scrimmage season coming in 1989 when he logged 521 yards rushing. At that time Score, Fleer, and Topps all created cards of Tim. Since I did not have his USFL issue- these 3 fit the bill nicely. Tim has gone into coaching. He joined Ohio State’s staff in 1994 and gained valuable experience on their staff as a runningback coach. He jumped to the NFL level in 2004 with the Bears, holding that position until 2012. He joined the Buccaneers coaching staff in 2014 and remains on their staff as of 2016.